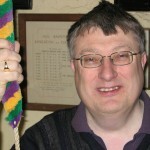 Welcome to the Kingston upon Thames bell ringers’ web site. Bell ringing is a great hobby with many aspects to interest everybody. We are a friendly group of people and always pleased to see visitors at our practices on Wednesday evening and for service ringing on Sundays. We are also delighted to hear from anybody who is interested in learning to ring. Come up and see us at our Wednesday practice night and find out what goes on!